- Rhonda Whitaker is a Master’s level practitioner in the field of developmental psychology. She has over 25 years of experience working with children through adults with diverse developmental needs. She has a passion for making a difference in the lives of children and continues to learn from all those who touch her life. Rhonda lives in Phoenix, Arizona with her husband and two children, and hopes to never be out of touch with her inner child. Uh-Oh Baby! is a children’s picture book written by Rhonda Whitaker and illustrated by Penny Weber. Each page in this book, designed for babies and toddlers and their parents, shows what is a familiar scene for new parents. There’s the delightful game of peek-a-boo which never seems to grow old for a young child. Sometimes, things spill or get knocked over and end up accidentally on the floor. Mealtime can be a gloriously messy affair especially with foods like spaghetti. Little ones often get the biggest charge out of playing with their food as well as eating it. Bath time is also frequently a time when everyone gets a bit wet, whether in the bathtub or out. Everyone loves to splash in a warm sudsy bath. Finally, at day’s end, there are those tell-tale signs that baby is getting tired, from rubbing their eyes to stretching their mouths wide in a great big yawn. All of these are Uh-Oh moments that become treasured memories. 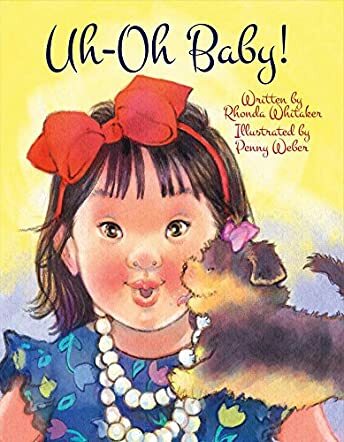 Rhonda Whitaker’s children’s picture book, Uh-Oh Baby!, celebrates the arrival of a new baby and the Uh-Oh moments that are part of everyday life with young ones. Each moment is captured with good humor and an appreciation of the joy that parenting can bring. Penny Weber’s illustrations are masterful. Each panel is colored in a range of pastel shades that work perfectly with the theme of this book. I especially appreciated the diversity of Weber’s charming images, which will ensure that everyone feels that they are part of the story. Uh-Oh Baby! is a grand selection for a bedtime story, and it’s recommended for parents and caregivers with very young children and toddlers. There are so many books out there that, while they are cute, show a rather cleaned up version of childhood. Rhonda Whitaker’s story, Uh-oh Baby!, throws all that on the floor by focusing on the messy moments in life. And Penny Weber’s enchanting illustrations bring each page to life as babies spill milk, cover themselves with spaghetti and meatballs, paint themselves and the cat … and so on. Children learn that it is okay to be less than perfect (and even enjoy being messy!) and that dad and mom love them just the same. It is a charming read-aloud story great for children ages zero to four. Think of tucking this into a baby shower gift or as a gift for a young pre-reader you know. Penny Weber’s delightful cover picture grabbed my attention. And Rhonda Whitaker’s rhyming style made Uh-oh Baby! fun and engaging, both for me and my kids. I read it aloud to my four and two-year-olds and they giggled over all the messes, though my four-year-old confided that the part with Baby going off to dreamland at the end was her favorite. It is definitely a book to read over and over again. The tale is intriguing and the illustrations have so much soul that I have read Uh-oh Baby! about half a dozen times myself. I have the e-book version, but my kids are hitting me up to get them a hard copy. Definitely would be an excellent addition to any coffee table. Not to mention the kids’ bedroom bookshelves. Delightful, charming, a kids’ must-read. Uh-Oh Baby! by Rhonda Whitaker is an adorable storybook that highlights the uh-oh moments shared between parents and children, the delightful moments and expressions that cross the faces of infants and toddlers while they explore the world. The uh-oh moments are not restricted to cuddles and love, but they can happen any time and every time, anywhere and everywhere! This story captures those uh-oh moments, be it mealtime, bath time, or any other time, and encourages parents to spend as much time with their little ones to enjoy those uh-oh moments of their lives. The book also shows how simple things can fascinate small children and how uh-ohs can be fun and entertaining. This book has some beautiful illustrations that give clarity to the author’s words and make the uh-oh moments of our lives tangible and real to readers. The topic is refreshing and so original, and the pictures bring those uh-oh moments vividly to life. The story is filled with warmth and love and leaves readers with a nice feeling. It is a good bedtime storybook for parents and grandparents to read out to their kids and grandkids. It can also be used in classrooms to encourage small children to be more observant and appreciate the simple things around them. The book will definitely make a difference in the way children look at everything around them. We need more books like this; simple, yet they leave their mark in the minds of readers and guide them on how to look at life and their surroundings in a good way.